It is election time for Sri Lankans. Is it what people really need at this hour? It is revealed that in order to have an election, the Government should spend millions of rupees. Isn’t this a waste of money? It is a burden for the people of this country. This question should be asked from us individually. During these days we will able to see many candidates and political leaders smiling with us according to posters banners available in the vicinity. We must think whether they are smiling for the voters who goes around them. Actually, it is revealed that those candidates are begging for votes in order to get elected. Interestingly, people of our country still go after them to get some kind of benefit for them. Even during this New Year, it is the paramount duty of the citizens of our country to take the first step by voting in favour of candidates who are educated, honest and efficient. During this election let us educate our people to vote for candidates who are eligible with those above-said qualities to their respective electorates. We as voters must teach a good lesson for the politicians who have given us empty promises for a long time. Now time has come because enough is enough. With the local authority elections around the corner, we can see a lot of activity in the political arena. The politicians are vying with each other to attract the voters by displaying banners and cutouts at prominent locations. Handouts are circulated and posters are also being pasted on walls, trees and every inch of space which can be found, violating the election laws. The local authority elections are the stepping stone for a candidate to come into the limelight and to prove him/herself. So by hook or by crook the candidate tries to secure a seat. Colossal amount of money is being spent on election campaigns, as they are aware that once they are elected, they can recover the money spent by resorting to corrupt practices. This is the pathetic situation the Sri Lankan citizens have to face. With the preferential vote system being in existence during the last few decades, there has been unhealthy rivalry building up among the candidates, even going to the extent of causing physical injury to the opposing candidates, their family members and supporters. However, after years, we expect to see a change in this scenario, as the voters are waiting to see the new electoral system being implemented in the local authority elections in February 2018. The voters will be given the opportunity of electing the candidate of their choice from one’s own town. 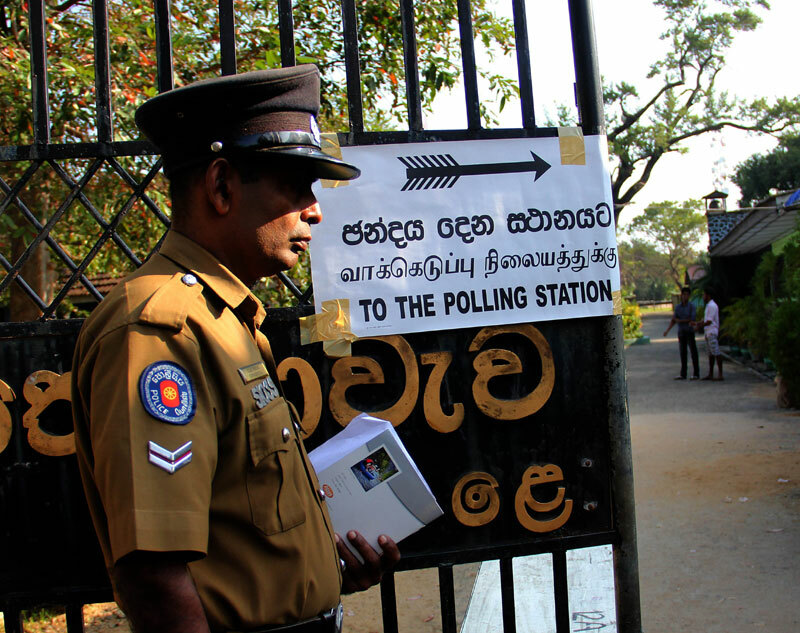 Further with the establishment of the elections commission, the Sri Lankan people expect to witness a free and fair election, with lesser number of incidents being reported and the violators being brought to justice. So let’s wait patiently to experience a positive change. Commenting on an absurd status of petty political driven election; it reminisces of ‘Emperor’s New Clothes’ which is more apt in today’s setting. There is no shame on the part of the political candidates, who are virtually worse than the emperor in the fairy tale concerned. The blatant truth is denied and not admitted by both the politicians and people alike, despite this happening in front of everybody’s eyes. People will hear the sounds, see the procession and like the emperor who assumed to be wearing his new attire, there will be no permanent shift for improvement of this country. One is that opposed to the emperor, the innocent people are fooled and mocked repeatedly by the shameless rulers. Second, is that the elections are a waste of public funds and resources for a country. Third, elections are likely to be associated with violence and violations, rather than the sense of humour in the story. Fourth, impression of elections is ugly with mud throwing and rebukes. When voting people of this country, we hear many slogans when election fever is around the corner. These statements sound as if Sri Lanka is one of the best countries to live in. Yes, we will all be happy to embrace and live with that thought. But it is pointless as what we hear remain to be mere words. It is shocking – the ranking of Sri Lanka on various indices at international level. These raise doubts as if Sri Lanka is slightly better than some countries which are known to be under-developed, where its people and societies resemble to be relatively primitive. After a short time, our people tend to have forgotten these eye-openers over some good news or even winning over a cricket match. Election fever and election campaigns raise many conundrums. The onus to be accountable is on politicians who are proxies for the citizens. Probably, people of this country, both the voters and the general public and rulers are forgetful and take elections for granted, not knowing what their rights and duties are. Thus, give rise to continuation of elections in Sri Lanka, which is now a menace and disruption for the rational Sri Lankan. Election system in Sri Lanka has gone haywire. Sri Lanka is beaten by corruption more than poverty. Elections have become a reason and also an outcome of this corrupt governance. The only guaranteed outcome is that elections happen to be burden on state coffers, without substantial progress on the part of the country. After many constitution changes and elections that took place in Sri Lanka, the country is pushed back each time. After many years of unethical practices, violating of certain election laws has become a norm. The citizens of this country bear the burden of state expenses and the ill effects of aftermath elections. Some are on the notion that election times allow to have a short break, watch a string of movies in TV and have some enjoyable time together. May be the common man are exhausted to understand the gravity of this in entirety, and fail to grasp that they too are targeted even for a short time in somebody’s political plan. Elections have been unable to serve its purpose and the people of this nation, but to the benefit of the rulers. Elections can be seen as a manoeuvring tool for mere passing of the baton. Election times make securities market and the bourse to hyper-react, causing speculation to be more politicised than the then prevailing political status. For the past fifty years, elections have shown the pattern of two main parties in the battle, that has proved to be futile for people of this country. These two parties are where most of the voting people cast their vote for, no matter what the consequences are. The lack of an alternative and suitable party to vote for is also a reason for this. Politicians use people and business sectors as bait – exploit people and business plans, arouse them, and create more risks. Small and medium scale enterprises who account for a major component are more vulnerable to economic upheavals. More often, clashes occur between those who pose to be supporters. As a result, prey is taken through the less powerful and such people become culprits who are often subject to revenge in election violence. It is ultimately the helpless people who pay the revenge. The powerful are culpable, yet always privy to many advantages and being on the safe side. After creating all the havoc, politicians do maintain good relationships with members of the opposition parties. In Sri Lanka, elections are a part and parcel of our lifestyle. We have seen many elections during our lifetime in our country. So many promises and pledges were given to us by our leaders during the past decade. However, how many politicians have kept their promises and pledges? It is a question that we must think of during these days. It is interesting to see candidates going from house to house begging for votes. We are fortunate to see these people who go around the country in their luxury vehicles walking along with the people from various social back grounds around the village/town. Even for a villager it is an interesting period for them as they were treated with food, hard liquor and goods free of charge. We must think why those candidates spend their money and assets to win an election. It is important to think of the benefits they receive during this time. We have witnessed that wealthy people come forward to sponsor some candidates. I am of the view that it is important to have elections in a country. It is very economical if we have elections such as Presidential, Parliamentary, Provincial Council and Local Government elections in a single day. Then we could have saved couple of billions of rupees for our country. I think it is a mandatory requirement to introduce that candidates who come forward to contest in an election should be educated and uncorrupted persons. Today we witness that various individuals come forward to contest for various political parties. It is the duty of the legislature to introduce these new guidelines if we want to achieve a prosperous and fruitful country. Decades back, election traditions took off with excitement, campaigns with lesser violence and those days, people awaited election results via radio unlike online media today. Perhaps, this tradition may not have suited, considering the civilized and discipline levels of Sri Lankan society. Hence, this tradition should have been nipped from the bud. This promise-based carrot and stick approach still continues and similar trends continue in a dangerous way, as country’s political culture and calibre of politicians took a disappointing turn. Presently it appears to be aggressive and indecent in how these political parties project themselves, preparing for elections. Politicians put themselves and their parties into the limelight and make the public keep their fingers crossed before they are fooled by each election. Many promises which are broad and beyond the capacity are made to the public. These promises are now deemed to be mandatory for elections. Blaming and accusing other parties to enhance their image and receive public attention, so that the wrongdoings are brought into light, all in all for the sake of getting votes. Still there are segments of people who are less privileged or preferred to thrive or depend on election favours. To this context, some commonalities of election traditions continue to date.